The decade after 11 September 2001 saw the enactment of counter-terrorism laws around the world. These laws challenged assumptions about public institutions, human rights and constitutional law. Those challenges are particularly apparent in the context of the increased surveillance powers granted to many law enforcement and intelligence agencies. This book brings together leading legal scholars in the field of counter-terrorism and constitutional law, and focuses their attention on the issue of surveillance. 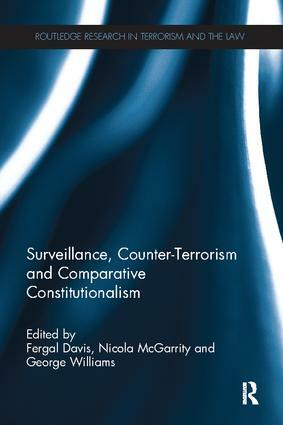 The breadth of topics covered in this collection include: the growth and diversification of mechanisms of mass surveillance, the challenges that technological developments pose for constitutionalism, new actors in the surveillance state (such as local communities and private organisations), the use of surveillance material as evidence in court, and the effectiveness of constitutional and other forms of review of surveillance powers. The book brings a strong legal focus to the debate surrounding surveillance and counter-terrorism, and draws important conclusions about the constitutional implications of the expansion of surveillance powers after 9/11. Part II Who is watching?